Feed and Livestock magazine is a trade publication launched in 2003 to provide an insight into markets and industry in Thailand, Asean and across Asia. 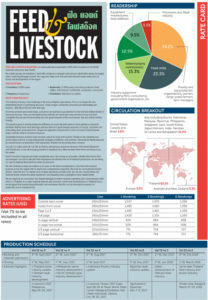 Print Readership: Based on industry standards, each issue reaches 12,000 poultry and swine producers, food processors, feed millers, veterinarians, nutritionists, researchers, consultants. Digital: Free download of current and back issues. Shows and Meetings participation: We participate in trade shows, international meetings, seminars and conferences relating to feed and livestock industry. We disseminate hundreds copies of each issue at each show. Distribution: In addition to direct mailing, we also provide copies to suppliers to distribute directly to their clients. WHY Advertise with Feed and Livestock Magazine? The industry is facing a new challenge in the form of higher expectations. Price is no longer the sole determining factor in purchasing decisions. Today’s hyper-connected consumers are demanding safe, hygienic, ethically produced meat and eggs. Driven by activism and social media, consumers are starting to pay attention to the formerly hidden details of animal production. They are investigating how animals are raised and many are keen to buy only from companies that are perceived as being not only good stewards of the environment, but also animal welfare friendly. The extreme gains in animal production efficiency in recent decades seem to have sparked a consumer backlash. Raising more meat and eggs with less feed isn’t good enough anymore. In Europe, customers are demanding slow-growing broilers, despite the apparent contradiction in terms of overall environmental impact and the need to conserve resources. Sustainable business practices have become critical for long-term survival. Producers are adopting new technologies and fine-tuning management strategies. Antibiotics and synthetic chemicals are being replaced by natural extracts and probiotic feed ingredients. Markets are becoming more complex. Our job is to make sense of it all. We do that by cultivating an extensive network of first hand informants well-distributed across all emerging markets in Southeast Asia. What we learn from them, we bring to you, the reader. Feed & Livestock magazine provides exceptional value. By serving up actionable, reliable information that top managers can use to educate their employees and advance the art of livestock production, we are doing our part to improve feed and food safety for everyone. We will continue to keep our readers up-to-date on the latest developments in the feed and livestock business across the region with in-depth and comprehensive reporting. Not only do our trademark feature articles “open the box” to explain how complex operations actually work, but we also closely follow raw material trends, feature the latest equipment, and regularly shine a spotlight on new market trends. We are retaining our successful Thai-English bilingual format to facilitate marketing and communication with clients in Thailand. As a major regional exporter and innovator, events and developments in Thailand have a broad appeal that reaches beyond borders and we believe that this can be leveraged to expand our readership across Southeast Asia.